Love ice cream and healthy homemade desserts, sugar-free yet absolutely delicious? Then this recipe is for you, and you don’t even need an ice cream maker. At the moment I’m in love with Matcha (Green Tea). 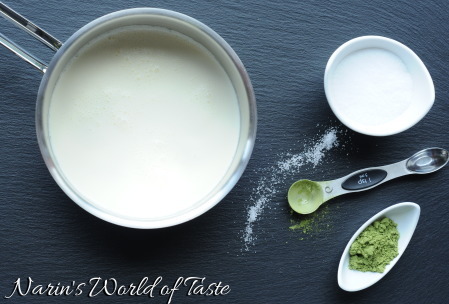 Its slightly herbal taste combined with something creamy and sweet is a great taste experience. One day I had Matcha ice cream prepared for dinner with friends, but I realized it wasn’t enough for everyone. Looking for additional ingredients to add, I picked bananas. It was a winner, nicely enhancing the Matcha flavor and adding a creamy texture. 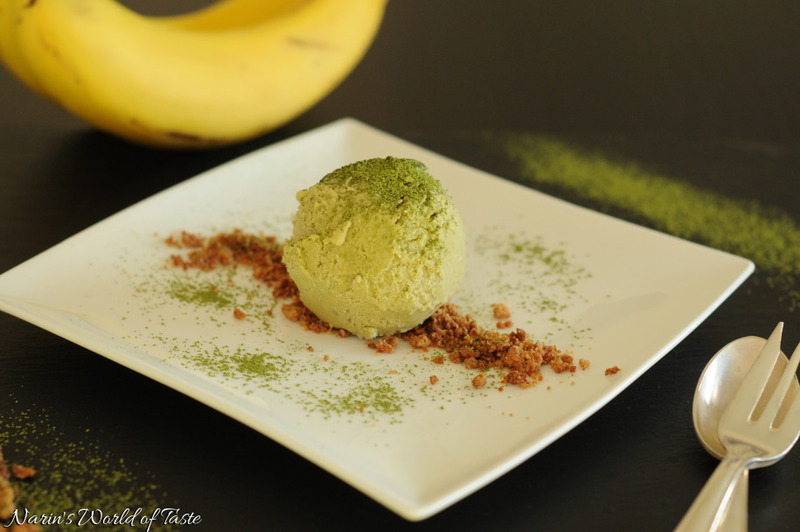 Our guests loved it, and now we always have some Matcha Banana Ice Cream in our freezer. Start by peeling the bananas and slicing them into about 1 cm pieces. 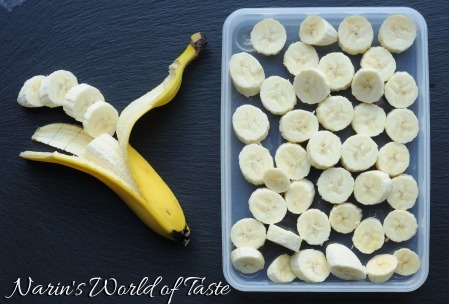 Layer the pieces of banana in a Tupperware and put them in the freezer for about 2 hours. Meanwhile, heat about half of the heavy whipping cream and the Xylitol. Pass the Matcha trough a fine sieve and add as well. That way you end up with fine powder. Stir until the Xylitol and Matcha is completely dissolved, then remove from the stove and let it cool. 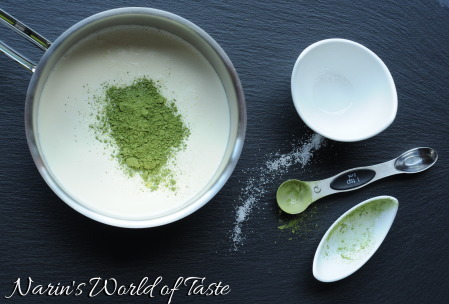 If the Matcha forms clumps, you can also blend the mixture by using your hand blender. Once the mixture is cold, add the frozen bananas and blend with your hand blender or pour the mixture into a regular blender until you have a smooth cream. Then whip the other half of the heavy whipping cream and fold it into the smooth mixture. Pour it into a Tupperware and put in the freezer. It needs to freeze for at least 6-12 hours, and you need to stir the ice cream occasionally, initially every 1-2 hours. Now you have some options in terms of timing and texture. If you serve it after 6 hours, it may not be completely frozen and the texture will be creamier. After 12 or more hours, it will be completely frozen. I would recommend removing the ice cream from the freezer about 30 minutes before serving. 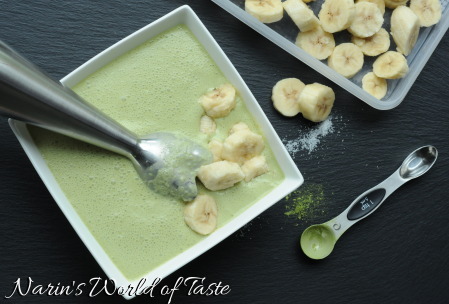 Scoop out a nice spoon of the Matcha Banana Ice Cream onto a serving dish. You can sprinkle some Matcha on top to garnish. This ice cream also goes well in combination with other desserts, for example, with my Dark Chocolate Cake with Forest Berry Foam and some fresh berries, and/or with my Healthy Crumbles like in the pictures (recipe will follow soon). Very delicious icy combination of banana and Matcha. 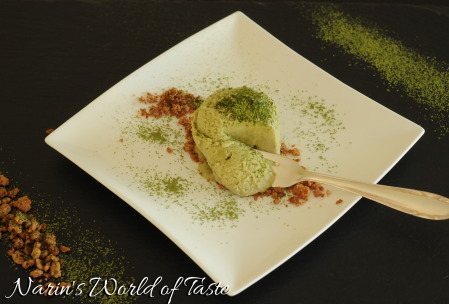 I especially like the Matcha powder as garnish on top of the ice cream because it gives an additional tingle. Well done, Melanie!! Thank you Attila! That’s right, it brings out the flavor of the Matcha even more.